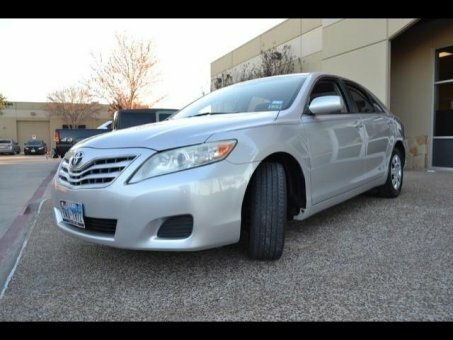 2010 Toyota Camry 2.5L 4-cyl engine w/VVT-i Highlights- Roomy cabin, extraordinarily refined and fuel-efficient V6, quiet and cushy ride, excellent crash test scores. The Camry features 16-inch steel wheels, air-conditioning, auto up/down windows for all four doors, a six-speaker CD audio system with an auxiliary input jack, a tilt-and-telescoping steering wheel, cruise control, full power accessories and a 60/40 split-folding rear seat. Every 2010 Toyota Camry comes with antilock brakes with brake assist, stability control, front-seat side airbags, full-length side curtain airbags and a driver knee airbag. In crash tests conducted by the National Highway Traffic Safety Administration, the Camry earned a perfect five stars in all frontal and side impact categories. The Insurance Institute for Highway Safety gave it the top rating of "Good" in its frontal-offset and side-impact crash tests.